With the recent snow (even more today) and the awful Chicago weather, I had to drag my neglected golf clubs inside and try my hand at indoor golf. Its official. I am as good at real golf as I am at indoor golf. Bogies Indoor Golf Club has 8 simulators, tons of famous golf courses to choose from, comfy leather couches and chairs to sit in while waiting for your turn, several TV’s mounted between each simulator, and a pretty sweet lunch deal during the week (I had pizza). We played Bethpage Black’s back nine, with three guys taking way to many mulligans and finished in less than 90 minutes. The simulator screens are huge, pretty good graphics, semi easy to use, fairly accurate, and all in all fun to play. The screen is very large, and gives you a much better feel for your swing than hitting range balls in a bubble. There is some competitiveness with trying to outscore your buddies, and its nice to have a target to hit at that changes all the time. The computers are hard to set up, but the staff from Bogies takes care of that for you. My only complaint is chipping and putting. I really don’t know how far 18 feet is when I chip. I see it and feel out those types of shots. Its rough when you have to try to think how far something is, and basically hit it blind. The screen does not help much on depth perception, which in turn makes the shorter shots more difficult. Putting is not as much fun either. You are putting to a screen and there is no hole to putt to. The simulators are great for long shots, and a little hit or miss on the short ones. Really doesn’t help with the whole drive for show putt for dough stance on golf. All in all, I give Bogies Indoor Golf Club in Oswego, IL a solid PAR. It is fun to play, better than just hitting up the range, very stylish and comfortable with the lounge feel when you are not playing, and a great work out for us golfers confined indoors in the winter. I will be back to Bogies, and excited to play some of golf’s finest courses. 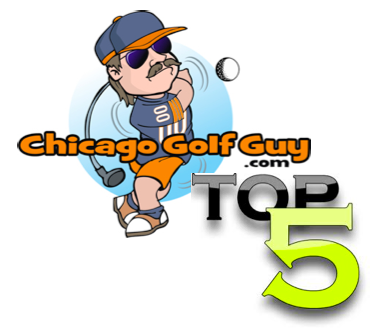 Previous Vote or Die with the Chicago Golf Guy!